Numerous silicone formulations have been developed for a wide variety of commercial applications. Some offer high strength and stiffness; others provide a soft and sticky character. Silon-IPN® from Bio Med Sciences combines the best of both worlds. Bio Med Sciences’ Interpenetrating Polymer Network technology combines strength and softness or adhesion in one unique formulation. 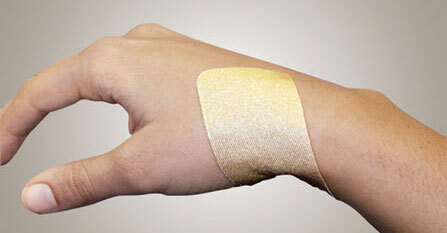 Silon-IPN® is ideal for a wide range of clinical and consumer wound, scar or skin care products — as well as other medical and non-medical applications. Silon-IPN® semipermeable membranes are a unique blend of silicone and Teflon® (PTFE), resulting in very thin sheets of soft & tacky silicone with significantly enhanced physical strength. Silon-IPN® membranes are available in continuous lengths and in a variety of formulations. Contact us today to inquire about custom fabrication for your specific needs.